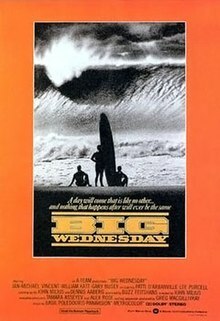 Big Wednesday is a 1978 American coming of age film directed by John Milius. Written by Milius and Dennis Aaberg, it is loosely based on their own experiences at Malibu. The picture stars Jan-Michael Vincent, William Katt, and Gary Busey as California surfers facing life and the Vietnam War against the backdrop of their love of surfing. The film tells the story of three young friends whose passion in life is surfing. The friends include: Matt Johnson (Jan-Michael Vincent), a self-destructive type who has a devil-may-care attitude; Jack Barlowe (William Katt), the calm and responsible one of the bunch; and Leroy "The Masochist" Smith (Gary Busey), whose nickname tells a lot about his personality. Their surfing lives are traced from the summer of 1962 to their attempts of dodging the Vietnam War draft in 1965 (including faking insanity, homosexuality, and all manner of medical ailments), and to the end of their innocence in 1968 when one of their friends is killed in Vietnam. The three make the difficult transition to adulthood with parties, surf trips, marriage, and the war. The friends reunite years later, after Barlowe has served in Vietnam, for the "Great Swell of '74." With this reunion, the transition in their lives becomes the end point of what the 1960s meant to so many as they see that the times have changed, and what was a time of innocence is gone forever. Raised in Southern California, Milius made Big Wednesday as an homage to the time he spent in Malibu during his youth. Milius and his friends George Lucas and Steven Spielberg famously agreed to exchange a percentage point of Big Wednesday, Star Wars and Close Encounters of the Third Kind prior to the release of the three films throughout 1977-1978. Spielberg in particular was certain that Big Wednesday was going to be a box office hit, opining it was like "American Graffiti meets Jaws", two of the decade's most successful films. Milius wrote the script with his friend and fellow surfer, journalist Denny Aaberg. It was inspired by a short story Aaberg had published in a 1974 Surfer Magazine entitled "No Pants Mance", and the lives of a group of friends who used to surf with Aaberg and Milius including Lance Carson. "A lot of things happened to me," said Milius. "A lot of the characters are me and in another sense none of them are me. It took an awful long time to write the script. It is so very personal. It's about growing up and relationships and the surf is the exotic background. We all knew it was special, we knew it wouldn't last. And we knew how good we had it. Surfing is a strange thing. A lot of people never leave it. You always feel you owe it something. It was a central experience in our lives. It's all changed now." Milius and Aaberg interviewed a lot of their friends from the 1960s. "It was a special time," said Aaberg of the 1960s. "Surfing was a brand new sport with its own aristocracy." Aaberg says "it took about a year to write" the script. "We very much want it to be authentic. That's important to me because I'm a real surfer. So's John." "Because I surfed, I'm the only director in the world who could have made his picture," said Milius. "And I can tell you, it's so hard, no one will ever make it again." It's a surfing HOW GREEN WAS MY VALLEY: the loss of an aristocracy, the end of an era, the passing of a more innocent time to a more corrupt and complex one-all growing up is the passing of innocence. It's based on the lives of three friends ten years ago. It's about their friendship, and the value of friendship. I don't think that kids today have the same kind of values that these people had then; I don't see movies being made about that kind of thing. This movie is about friendship: surfing is just the background. It's about love of a place, love of a time, love of your human contacts, and the loss of those things. It's the most personal film I'll probably ever make, and I figured I ought to do it now, before I get too far away from it. At least half the people who participated are dead now. The attrition rate among surfers is very high. A lot of them died in Vietnam and OD'd on dope. Milius and producer Feitshans had met at American International Pictures, where they worked on Dillinger. They formed their own company, The A Team. This was their first production. They obtained finance from Warner Bros in June 1976. The following month it was announced Big Wednesday would be postponed because it was not ready and Milius would instead make Extreme Prejudice. "I've been working on Big Wednesday a long time," Milius said. "I don't want to put it off any further but I don't want to work on it until its ready either." However Milius changed his mind again. "John has fallen in love and is getting married and that's opened up this other side of him," said star William Katt. "He was going to do another gun and guts macho fight film but he decided to do this; he decided he needed this in his life." Milius at one stage intended to play the role of the Bear himself. "But I couldn't," he said. "The part is simply too big for me to do." Barbara Hale, mother of William Katt, plays a small role in the film. A 1940s film star but best known as Della Street from the long-running Perry Mason television series, this was Hale's last appearance in a feature film. "It was the most personal film I'd done," said Katt. "I'd lived that life since I was ten." When I did Big Wednesday my first impressions were that I was going to do this coming-of-age story with Arthurian overtones about surfers that nobody took seriously, their troubled lives made larger than life by their experience with the sea. And that’s what the movie is. It never strayed from that. There was a lot of pressure to make it more like Animal House, but the movie has a huge following now because it did have loftier ambitions. It wasn’t just a story about somebody trying to ride the biggest wave or something. That’s not enough. The surfing scenes used in the finale to Big Wednesday were not filmed in California, where the film is set, but at Sunset Beach in Pupukea, Hawaii. Other filming locations included El Paso, Texas; Hollister Ranch near Santa Barbara; Surfrider Beach (in Malibu); Ventura, California; and La Libertad, El Salvador. "What I've got to watch out for is getting lost in the surf again," said Milius during filming. "It's so alluring, so easy to get lost in. I worry I might lose sight of the characters. Unlike any other film that has been made about surfing, in this one the characters and not the waves are the most important." Anthea Sylbert was an executive at Warners at the time. She later called the film "a classic example of an egomaniacal insane man going over budget and not listening to anyone. I mean, they were all just waiting for the Big Wave. Give me a break!" The film premiered in wide release in the United States on May 26, 1978. The picture was screened at various film festivals, including: the Davao City Film Festival, Philippines; the Turin Film Festival, Italy; and others. Big Wednesday was a box office flop upon its release, and was quickly pulled from theatres after taking in only $4.5 million. William Katt explained in a 1979 interview with Roger Ebert a year after the film's release that he believed the movie's failure was due to the marketing focusing only on the fight scenes and surfing angle. A 20th Anniversary screening (which included cast and crewmembers) took place at the Newport Film Festival in 1998. Janet Maslin, film critic for The New York Times, did not like the performances of the actors and wrote, "The surprise is not that Mr. Milius has made such a resoundingly awful film, but rather that he's made a bland one...the movie often seems even more uneventful than material like this need make it, and Mr. Milius's attention to his actors focuses more closely on their pectorals than on their performances. He encourages such stiffness in his players that Barbara Hale, for instance, is quite unconvincing as Mr. Katt's mother. This is a faux pas of no mean eminence; after all, Miss Hale actually is Mr. Katt's mother." Dave Kehr, writing for the Chicago Reader, was not as dismissive of the film, writing, "John Milius's paean to the art and discipline of hot dog surfing is marred by pushy philosophizing and a fair number of overripe lines, but its sincerity is deep and seductive...Milius can be faulted for reviving a number of ostensibly dead macho myths, but in the context of the subculture his film deftly re-creates, they take on the aura of eternal values. The breathtaking surfing footage, rather than the slightly stunted characters, makes his most eloquent argument." The staff at Variety wrote, "A rubber stamp wouldn't do for John Milius. So he took a sledgehammer and pounded Important all over Big Wednesday. This film about three Malibu surfers in the 1960s has been branded major statement and it's got Big Ideas about adolescence, friendship and the 1960s." The review aggregator Rotten Tomatoes reported that 70% of critics gave the film a positive review, based on 10 reviews." Milius later said the film was "sort of a numb spot in my life. It was a very personal film and it really tore me up when it was attacked in such a way that no one saw it." Dialogue of the film was used in Anderson Paaks "The Season | Carry me" on the album Malibu. Awards of the Japanese Academy: Award of the Japanese Academy Best Foreign Language Film; 1980. ^ a b c Warshaw, Matt (2005). The Encyclopedia of Surfing. Orlando, Florida, US: Harcourt. ISBN 978-0-15-603251-3. ^ Deadline.com (May 12, 2010). Accessed: August 7, 2013. ^ New York Surf Film Festival. Press release, August 6, 2008. Last accessed: December 1, 2009. ^ Simross, Lynn (26 September 1976). "Hanging Ten on a New Surfing Life: SURFRIDER". Los Angeles Times. p. g1. ^ a b c d e f Milius Waxes Up 'Big Wednesday' Warga, Wayne. Los Angeles Times (1923-Current File) [Los Angeles, Calif] 21 August 1977: n7. ^ Lindsey, Robert (28 May 1978). "THE NEW NEW WAVE OF FILM MAKERS: A young group of writer-directors has moved into positions of power in Hollywood. All friends they trade ideas, help one another to get jobs, and even share in profits from one another's films". New York Times. p. SM3. ^ Thompson, Richard (July–August 1976). "STOKED". Film Comment 12.4. pp. 10–21. ^ Kilday, Gregg (12 June 1976). "MOVIE CALL SHEET: Knievel to Star as Himself". Los Angeles Times. p. c7. ^ Kilday, Gregg (30 August 1976). "FILM CLIPS: 'Telefon' to Link Bronson, Siegel". Los Angeles Times. p. f7. ^ Turan, Kenneth (26 October 1977). "William Katt: New Golden Boy of Tile Romantic Lead Katt as the Golden Boy". The Washington Post. p. B1. ^ Lee, Grant (23 April 1978). "'Sundance': Meanwhile, Back at the Ranch...". Los Angeles Times. p. m40. ^ a b "Anthea Sylbert doesn't just drop director John Milius' name ...". Boston Globe. 30 August 1981. p. 1. ^ "Battling Waves -- and Reputation". Los Angeles Times. May 22, 1978. Retrieved December 5, 2016. ^ Ebert, Roger (June 3, 1979). "Interview with William Katt". Chicago Sun-Times. Retrieved August 7, 2013. ^ Maslin, Janet. The New York Times, film review, "Big Wednesday Gets Caught in Some Rough Surf: Buddyhood of Surfing", July 28, 1978. Accessed: August 7, 2013. ^ Kehr, Dave. Chicago Reader, film review, 1996-2007. Accessed: August 7, 2013. ^ Variety. Staff film review, December 31, 1977. Accessed: January 30, 2011. ^ Big Wednesday at Rotten Tomatoes. Last accessed: January 11, 2015.